Donald is a town nearly midway between St Arnaud and Warracknabeal and 235 km north-west of Melbourne. It is on the Sunraysia Highway and the railway line to Mildura. 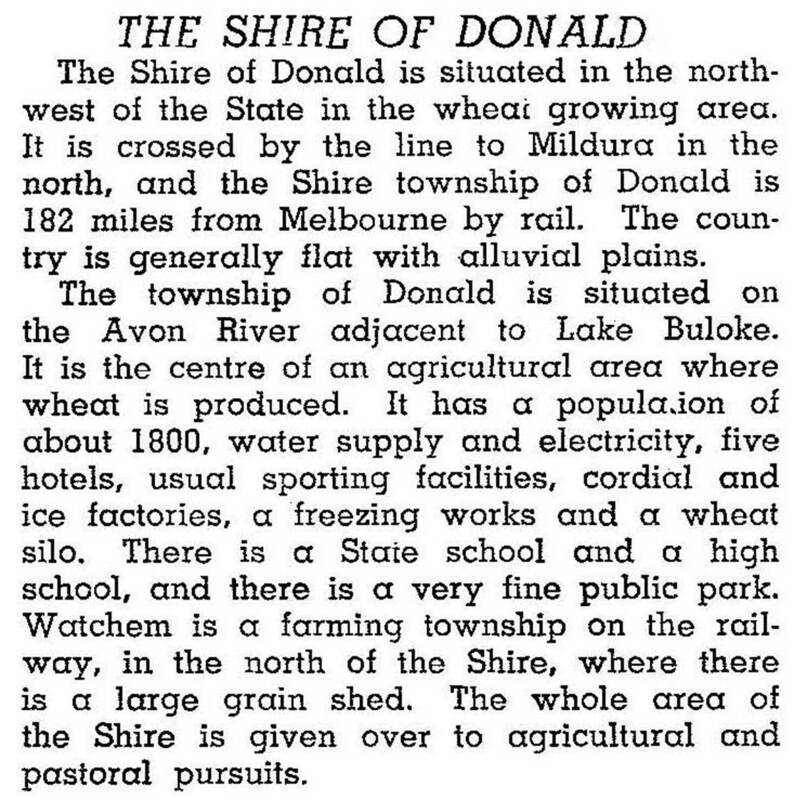 Donald was also the name of a shire (first so named in 1897) which ceased in 1995. The Donald township is on the Richardson River, and gained its existence from being situated on a crossing place. Its early names were Richardson Bridge or The Bridge. The earliest reference to 'Donald' is in a survey map of 1866, the new name commemorating William Donald who, with two brothers, took up the Banyenong pastoral run in 1844. The township is in the Parish of Banyenong. William Donald, however, was not the person who pioneered the township. In 1863 the St Arnaud Road District Board had a bridge built over the Richardson River, and within a few months a German immigrant, Johann Meyer, built a store or shanty nearby. A year later a second building, a hotel, was built near the bridge. In 1866 the town of Donald was surveyed, by when there was also a Presbyterian church (1865), a police post, stores attached to the hotels and a butchery. Closer settlement did not occur until the 1870s when farm selections were taken up. A government school was opened in 1873, mainly from the initiative of Johann Meyer who later constructed several buildings in Donald, acted as postmaster and served on the shire council. By the end of the 1870s most pastoral properties had been subdivided for closer settlement, and in 1882 the railway was extended from St Arnaud to Donald. Donald remained a terminus for nine years until the railway was extended to Birchip. A business directory published for Christmas 1893, recorded Donald as having three hotels, two boarding houses, several shops, an Egyptian Hall, two blacksmith/wheelwrights, Presbyterian, Anglican, Methodist and Catholic churches and a solicitor, George Oakley. Oakley's name lived on as Oakley Thompson (Melbourne) over one hundred years later. There was also a flourmill (1876-1925). Donald was in the far-flung St Arnaud Shire which occupied 8300 sq km. Between 1884 and 1897 St Arnaud Shire was divided into six shires, an indication of the rapid settlement of the Wimmera-Mallee farm lands. The southern part of the shire was severed in 1894. Named Kara Kara, it encircled St Arnaud township. 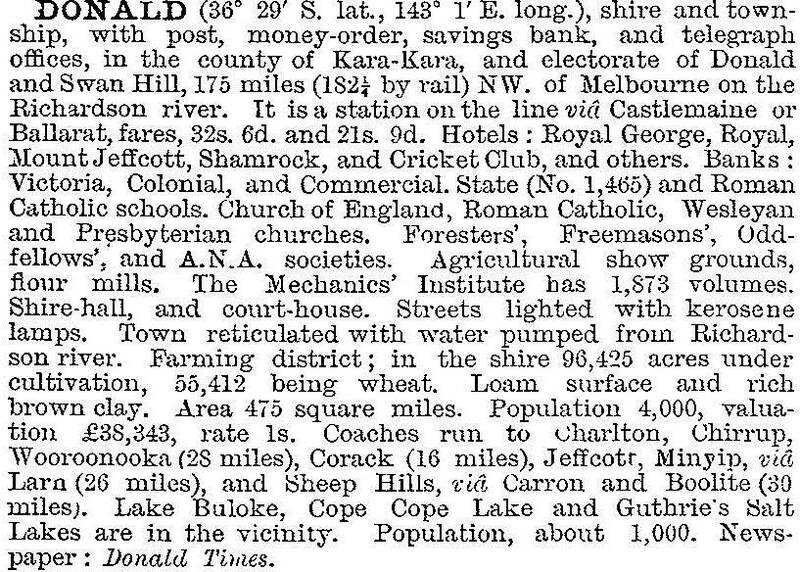 Curiously the remainder of the shire retained the name St Arnaud, and Donald was its administrative centre. During 1891-95 Borung, Birchip, Charlton and Wycheproof shires were severed leaving a fragment which on 11 February 1897, was changed in name from St Arnaud to Donald Shire. Its area was 1230 sq km. Donald was troubled from time to time by water shortages and by poor drainage in times of heavy rain. (The Richardson River empties into Lake Buloke about 6 km north of the township. The lake was sometimes a common and dry lake bed, and sometimes a storage 3 metres deep. It sometimes back flooded into Donald.) In 1895 the Donald Urban Waterworks Trust was formed, completing two earthen reservoirs supplied with water pumped from the river. After 1905 the State Rivers and Water Supply Commission began the Grampians supply system. Drainage was partly improved by sealing of roads and cutting of channels, and it took until the 1960s before drainage works and sewerage overcame Donald's flat gradients. A new shire hall and offices were built in Donald in 1912. Its unusual design was influenced by the Melbourne architect, Harold Desbrowe Annear. In the 1920s an inland abattoir and freezing works were opened, continuing until the early 1930s. A soldiers' memorial public hall was opened in 1923 and replaced with an art deco building when it burnt down in 1936. A less overt memorial to returned service personnel was the formation of a local branch of the white army in 1931, to oppose a supposed invasion by the unemployed and red raggers marching up the highway from Melbourne. The interregnum of the economic depression and World War II delayed the building of a hospital until 1954, which was swiftly followed by a swimming pool (1957) during the prosperous post war years for wool and wheat. A high school was opened in 1961. The falling away of primary produce prices influenced the council's decision to start a second abattoir which ran from 1971 to 1980. The abattoir had brought more population and a spate of home building to Donald. In 1986 the Council created an industrial estate, and a number of new industries were attracted. Offsetting this, the railway centre was scaled down. Salinity problems around Lake Buloke resulted in a salinity action group being formed in 1986, and tree planting was re-evaluated. There was also re-evaluation of traditional crops, with farmers trying chickpeas and sunflower seeds. Despite these activities the township's population declined by about 250 people to 1383 during 1976-96. Donald's role as a railway freight centre and local depot ended in the late 1980s and the rail passenger service ended in 1993. Donald has a wide range of organisations: a race club, an agricultural society, an active music literature and arts society which has extended to local history, golf, tennis and bowling clubs, and Uniting, Catholic and Anglican churches. The Catholic secondary school combined with the Charlton and St Arnaud campuses at Doobabetic, and there are State primary and secondary schools and a Catholic primary school. There is a sports stadium near the showground, a racecourse and Lake Buloke which is used for fishing and duck shooting. (The town has been ambiguously described as Donald, Duck country.) There are three hotels, two motels, a caravan park and a shopping centre in the town. The hospital is near a park which is situated on the Richardson River. The Buloke Times is published twice weekly. In September 2010 and again in January 2011 many parts of regional Victoria experienced widespread severe flooding. In Donald an evacuation order was issued with about 20 properties affected by the rising Avon and Richardson rivers. An emergency evacuation centre was established at Donald Showgrounds and Recreation Reserve. In 1994 farming occupied 94% of the shire's area, carrying 112,000 sheep and lambs, 9000 pigs and 3400 meat cattle. The wheat harvest was 55,410 tonnes and barley 50,705 tonnes. Cereal production occupied 471 sq km and legumes for grain occupied 239 sq km. On 20 January 1995, most of Donald Shire was united with Birchip, Charlton and Wycheproof shires and part of Kara Kara Shire to form Buloke Shire. The administrative centre was moved to the more commodious Wycheproof offices.